Since I had a mid-project change of heart and decided to use my bird illustration gallery wall in the living room instead of the hallway (you can click here to see that if you missed it), I had to come up with a new idea for my hallway. I have about 50 inches of space between the bathroom door (when it’s open) and the corner of the room to the left of the door, but I didn’t want to do another gallery wall. I wanted something completely different. So I’ve had those two extra columns stored away, just waiting for a bright idea to come along. This idea is exactly what I’ve been waiting for! The finish still needs work. I’m actually not sure if I’m going to leave it stained or paint it. I’d love to leave it stained if I can get the color right. Right now, it’s a little too orange for my taste. 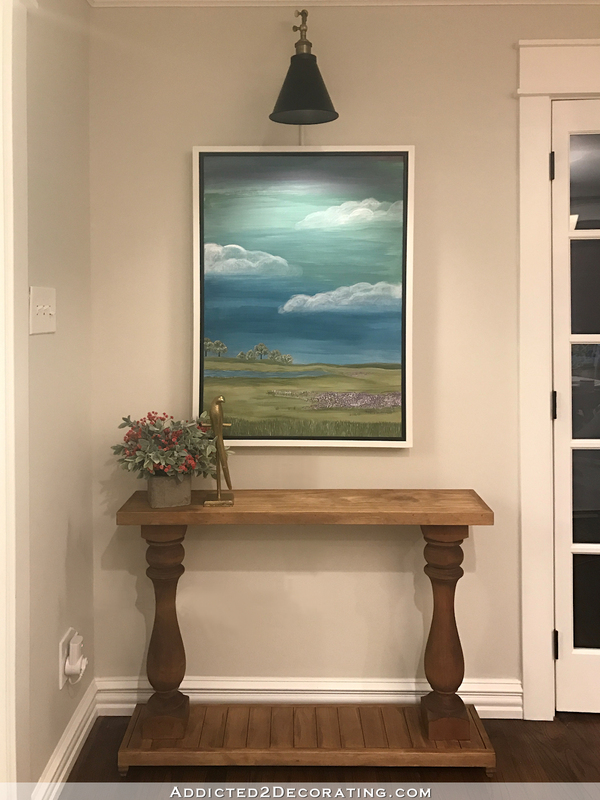 And it is going in the hallway, but I put it here in the breakfast room temporarily to show (both myself and you) what it’ll look like with artwork above it, since that’s the plan in the hallway. But I don’t have artwork for the hallway just yet. Anyway, let me show you how I made this. And of course, it can be scaled to any size you need. 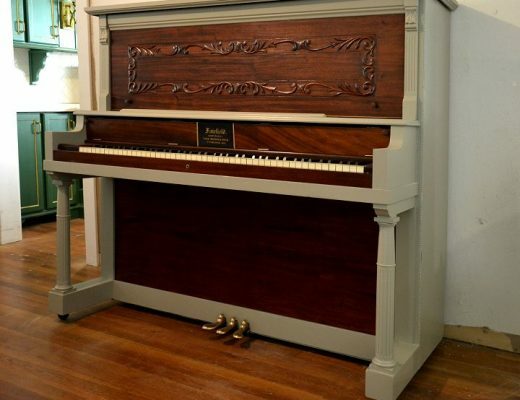 I needed mine small, so the finished measurements are 40″ long, 30″ tall, and 8.5″ wide. 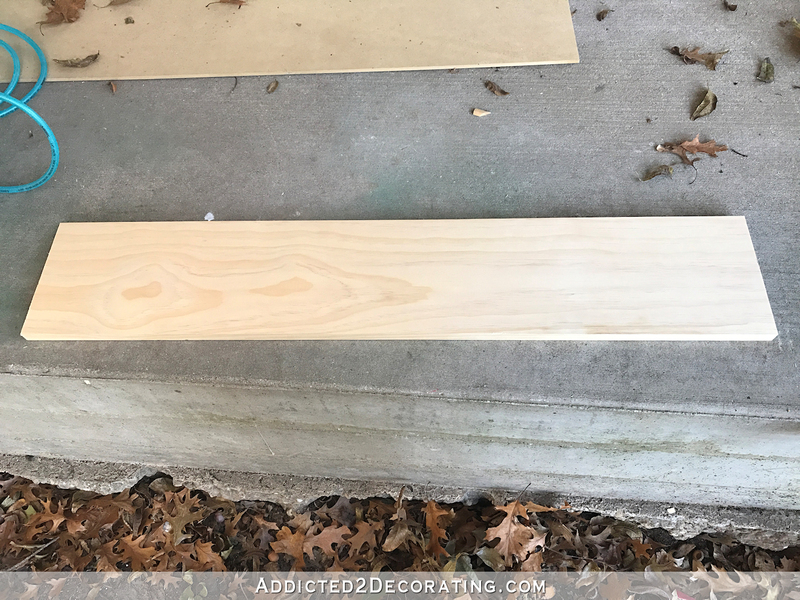 I started by making the top, and I just used a 1″ x 8″ piece of lumber cut to 38.5″ wide. Keep in mind that a 1″ x 8″ is neither 1″ thick nor 8″ wide. 😀 It’s 3/4″ thick and about 7 3/8″ wide. 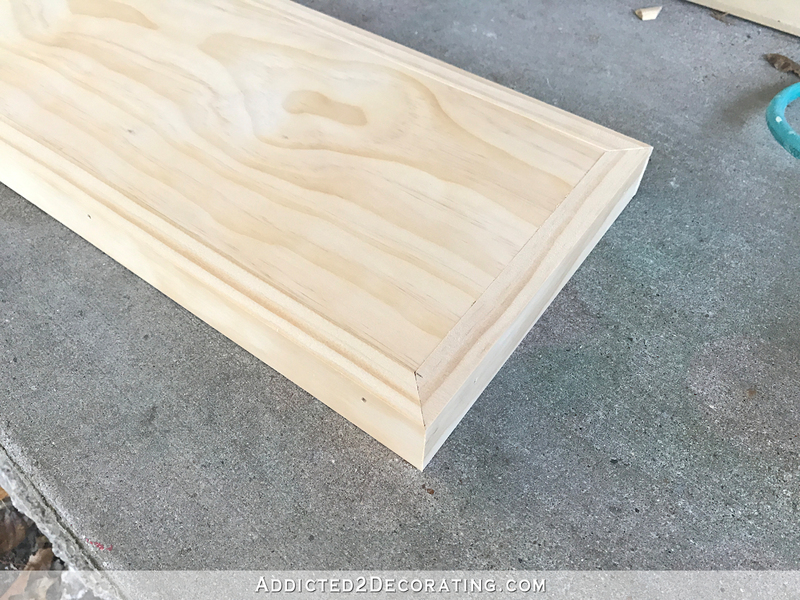 Next I used 1″ x 4″ lumber to “frame” the top piece, mitering those pieces on the corners and attaching them with 1.5″ 16-gauge nails in my nail gun. Then I loaded that thing up with wood filler (I’m very messy and very generous with the wood filler usage 😀 ) in all of the cracks, crevices, corners and nail holes, and then set it aside to dry while I moved on to the bottom. For the bottom shelf, I didn’t want a solid piece like the top shelf. 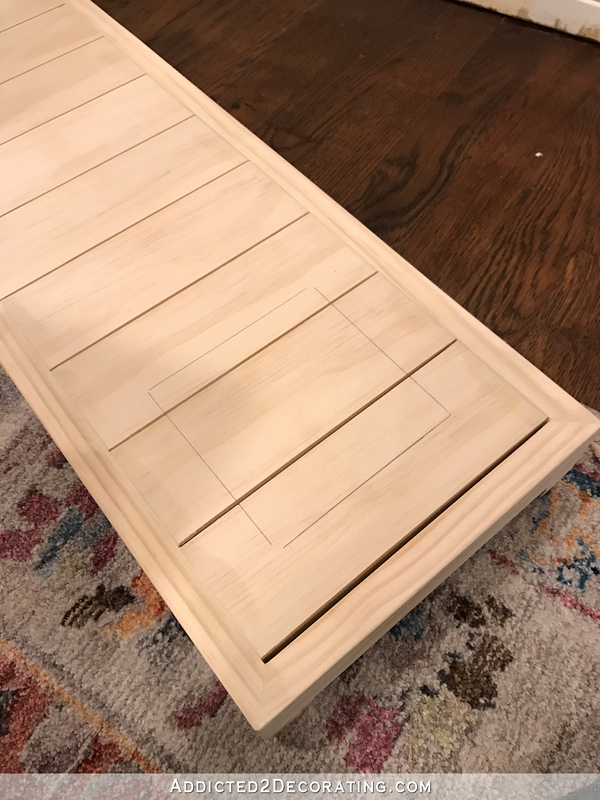 So I left out the center 1″ x 8″ piece of lumber, and just made a frame out of 1″ x 2″ lumber, cut to the exact same size that I used for the top shelf. I put the pieces together using 1.5″ 16-gauge nails on the corners. 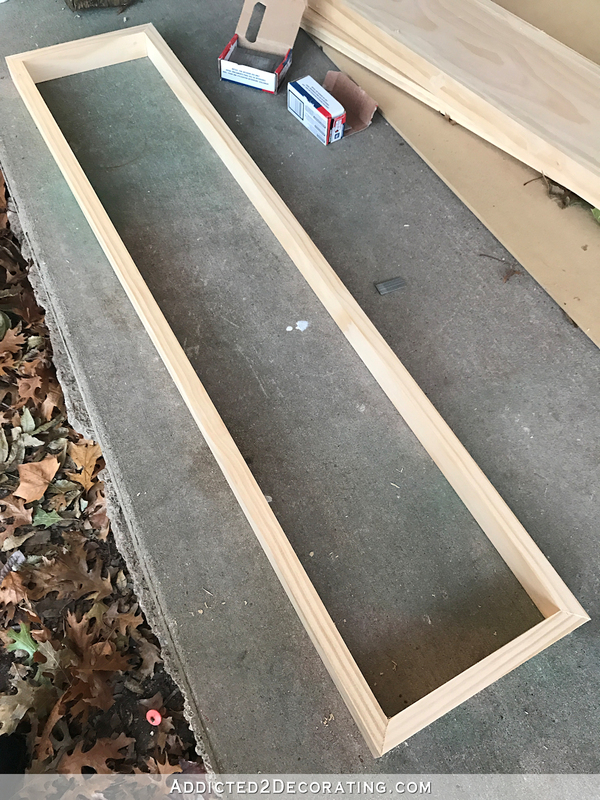 Next I took some scrap 1″ x 2″ lumber, cut to fit the inside length of the frame, and ripped them into narrow pieces using my table saw. 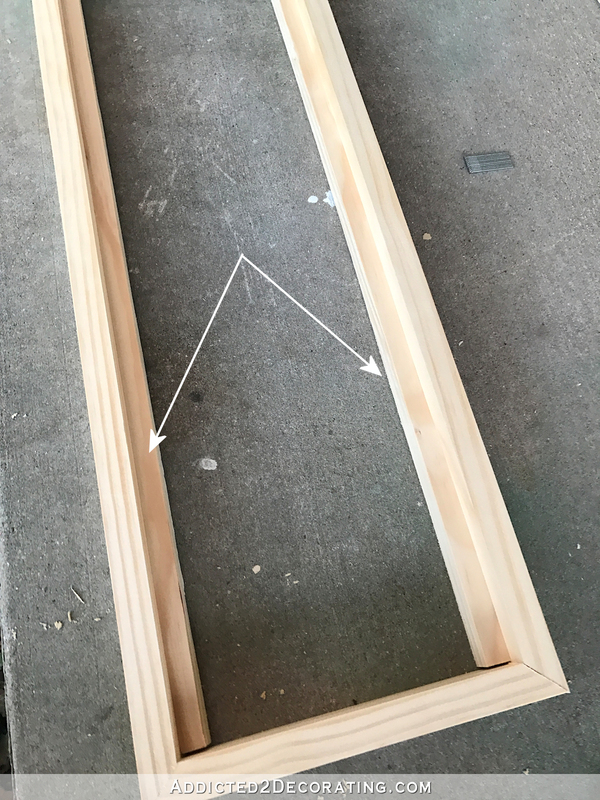 Then I nailed those pieces to the inside of the 1″ x 2″ frame with the bottom edge flush with the bottom of the frame, and making sure that the 3/4″ edge of the ripped lumber was the edge that I placed against the inside of the 1″ x 2″ frame. 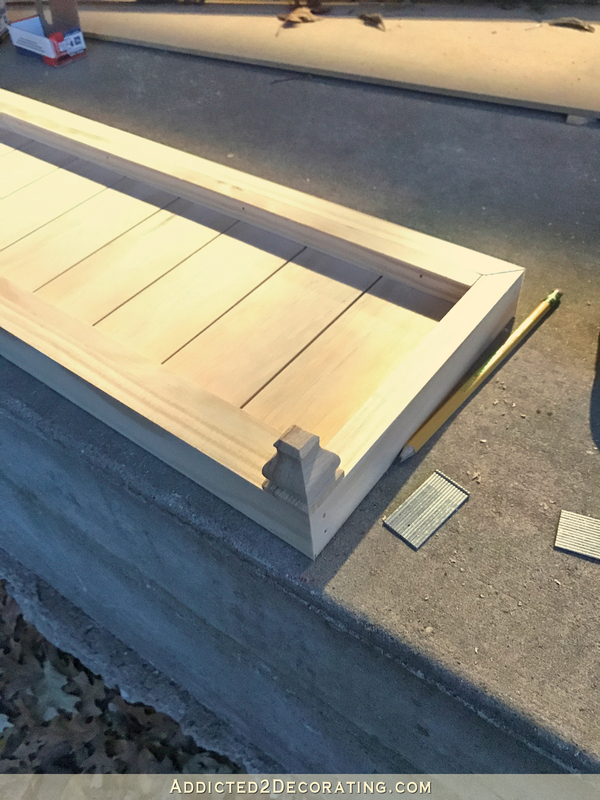 And then I cut some pieces of 1″ x 3″ lumber to fit inside the frame, resting on the ledges that I created in the step above. I started by measuring and marking the center, and then placed and nailed the center 1″ x 3″ piece, and then worked my way out towards each end. I used some 16-gauge nails as spacers between the boards. 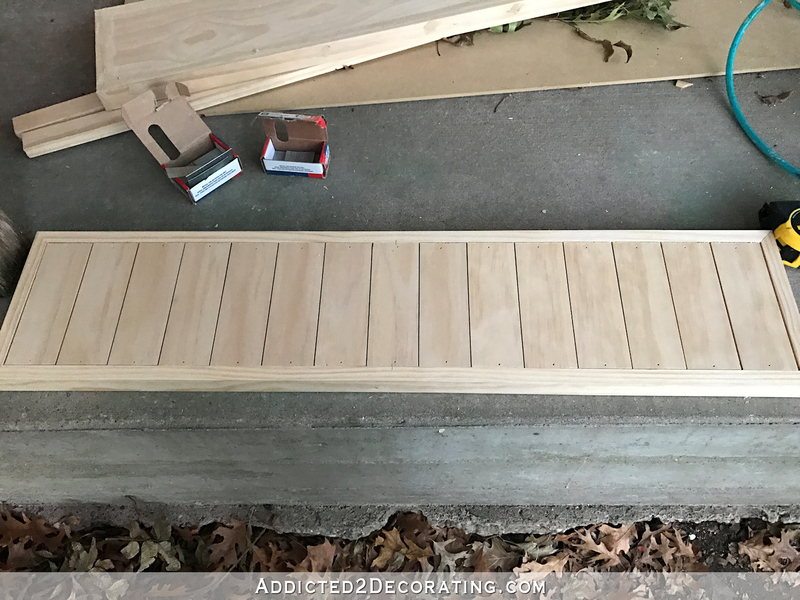 I used my miter saw to cut off just the decorative part, and then used wood glue to attach one to each corner of the bottom shelf. With all of the feet attached (I gave it about 15 minutes to let the glue set and then handled it carefully while it continued to dry), I loaded up the bottom shelf with wood filler. 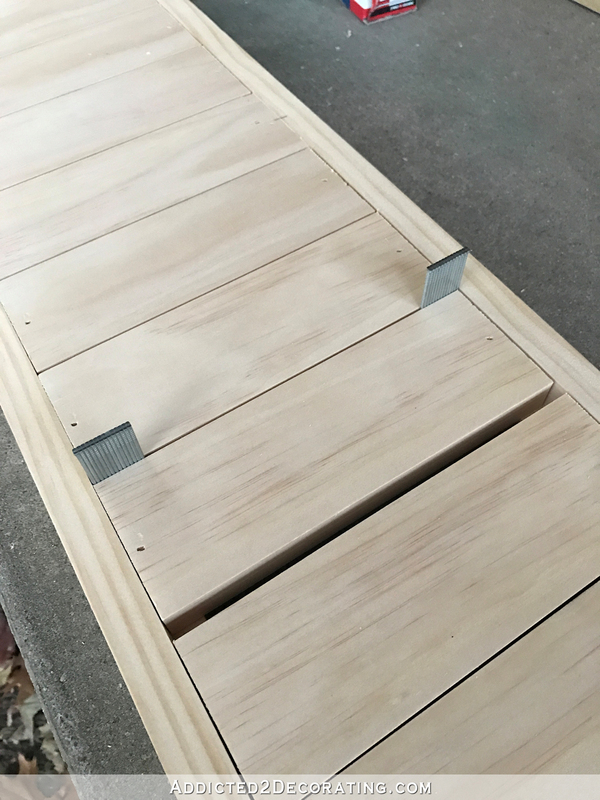 I tried to be careful not to get the wood filler between the slats, but I did wood fill where the slats met the outside frame, as well as the nail holes, corners, etc. I let all of the wood filler dry (about an hour) and then sanded both the top and the bottom shelves smooth using 150-grit sandpaper discs on my rotary sander. 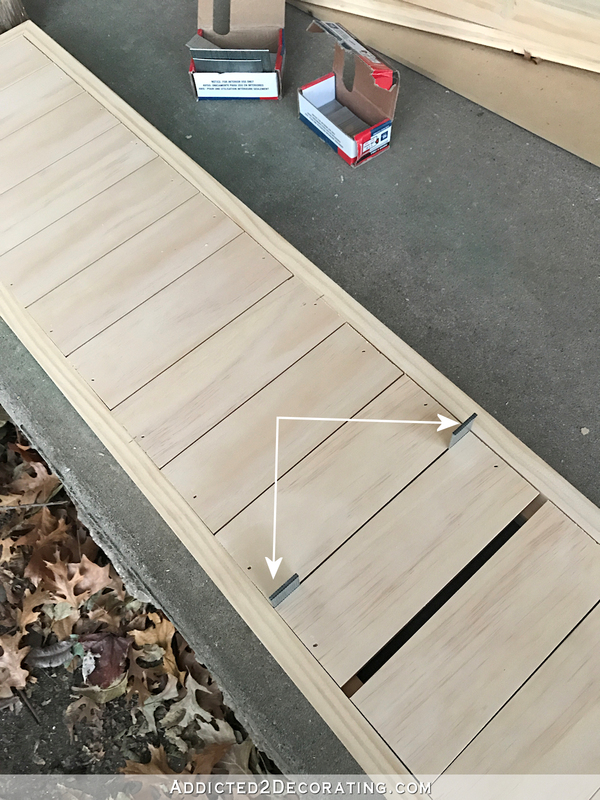 On any areas where the wood filler did get in between the slats, I just used my 16-gauge nails (that I had used as spacers) to dig out the wood filler. It worked perfectly. I cut my columns down to the right height using my miter saw, and then I was ready for assembly. …put wood glue in the square, and then placed the column back and lined it up with the pencil marks. And then I repeated that on the other side. For the top, I placed wood glue on the top of the columns, set the top in place, used my tape measure to make sure it was centered, and then shot one 18-gauge nail through the top into each column to hold it into place while the glue dried. And here’s the console table completely assembled. I think that wood glue is strong enough to hold the table together on its own, but I will probably go back and put two screws going through the bottom of the lower shelf and into the columns, predrilling the holes first so that I don’t take a chance at splitting the wood on the columns, just to be on the safe side. Since the shelves and feet are pine, and the columns are maple, I didn’t apply the stain in the regular way. I hoped to make the stain a little more even, so I mixed some stain (dark walnut) into my oil-based polyurethane and brushed it on. That actually worked pretty well, and I think if I were to brush one more coat of the stain/poly mix onto the shelves and feet, they would be a very close match to the columns. But I’m going to hold off on that for now, and I’ll make a decision once I get my artwork situation resolved. I have an idea for what I want hanging above this console in the hallway, but I’m having a hard time with the execution. Once that gets resolved and I can see the artwork on the wall, I’ll have a better feel for the direction the color of this console needs to go, or if I just need to paint it. Now I’ll admit that this project isn’t really a cheap project if you don’t just happen to have some turned wood columns lying around the house. Those columns can get expensive. The ones that I used are currently $115 each in maple, and that’s the cheapest wood species available in that design. But this is such a simple project, and can be so easily scaled up or down for any space you need to fill, so don’t write it off just because of the price of turned wood columns. One alternative to buying new columns is to keep an eye out at your local consignment stores, ReStore, Goodwill, Salvation Army Store, etc, for a piece of furniture that has wood columns or really chunky turned wood legs that you can disassemble and use. 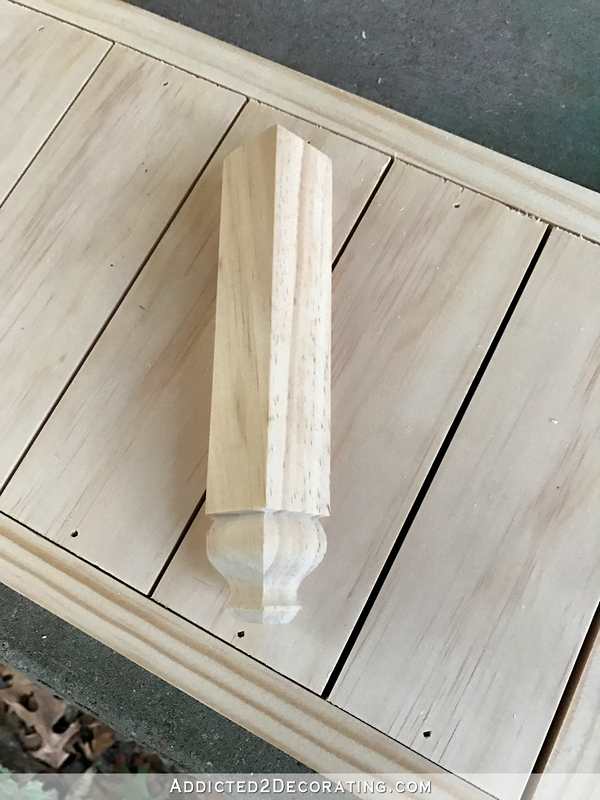 So often I see pieces in those stores with gorgeous turned wood legs or columns, and the price for the piece of furniture (that can be disassembled for the parts) is a fraction of what brand new turned wood legs or columns would cost. Another idea, for those of us who don’t own a lathe and aren’t master wood turners, is to build a simple square wood column out of regular lumber and trim. To get an idea of how to do that, check out my pony wall and columns project from a few years back. I couldn’t afford fancy turned wood columns for that project, so I improvised and built the columns with lumber and trim, and I think it turned out great! The same idea could be used for a table like this. Next Post Artificial Indoor Plants? Yes, Please! OMG, love it! This is by far my most favorite thing you have build!!! I second that Carole, it’s just beautiful! This is gorgeous and so creative! You make it look easy–ha ha. Please please don’t paint it!! It’s so pretty stained!! This may be my Most Favorite thing you have built! Love, Love, Love! Cute little versatile table you’ll get lots of use out of that piece-good job! I vote for painting it, not crazy about the stain. It’ll be a nice addition to your hallway. I vote for paint too. I like it but does the pine country furniture look really say Kristi? You continue to boggle the mind with your talents. This is fantastic, and it is a scaled down version of something I have wanted forever for a kitchen island. Lime wax will knock down that orange-y tone you don’t like. It is what we used on a kitchen table the husband stripped when it looked too orange. 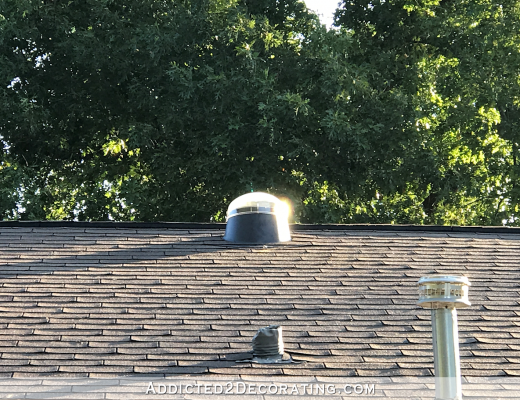 We put it right on over Howard’s Restore-a-Finish in Clear. You can still see the grain, but I like the white in all the grooves, as well as the washed look it has. You ingenuity and mad skills never cease to amaze me! Love that little table, and I think the stained look is great also. But, a coat of whitewash or lime would work too. You geaux, Kristi! I like it! It’s going to look great with a piece of art above it. Can’t wait to see what you’ll use. YES! YES! YES! This is something that l can do, l believe, once l get the mitering thing down pat! This is a gorgeous table and JUST the right size for my small entrance into the house in front. Dressy enough to impress, as well! Looks like a million bucks too, NOT homemade. Way to go, Kristi! May I ask where you purchased the turned legs you used? I think these columns are the most important part of the beautiful table. And I love that you could make it only 8 1/2 inches wide. You just can’t find a table that slim, and I have often tried. I did finally find a credenza that was only 11 1/2 inches wide for a tight place at my daughter’s home. But if my husband and I had this tutorial back then, we could easily have made this. But what we found fits the small place perfectly with room to spare. It’s also in a small nook before entering her bathroom. I mean it is 11 1/2 inches deep. It is 34 inches wide, and 30″ tall. I truly love this small table! It really is beautiful, but I must say I love the original look of the one that inspired you to begin with. I think I’d “pickle” it (kind of like whitewashing it). Whatever you choose to do, I know it’ll be gorgeous! Great job! And I’m so tickled for you to be knocking out these fun, decorative projects for the gratification they bring while doing them as well as being done. And this piece will bring joy for a long long time! Another winner, Kristi, and downright fun! Okay, so here I am in Ecuador (where woodworkers can do amazing things) thinking, ‘Hmmm, what a clever idea!’ Appraising the possibilities while staring at your ‘assembled table’ picture in front of the bird gallery, I am seeing things beyond the intended. 🙂 The wall plugin shows itself to be a little man, with arms extended upward, as though ready to beat a rectangular drum in celebration of your latest feat. You must have another piece of art in mind? I like the one you have in that space. “Elaine, the Funny Farm folks are on their way for you, so enough thoughts for this day.” They are here, so as I leave—I vote for paint so as to quiet the rustic vibe. On reading your latest post, it occurred to me what a great book your whole house journey (and the bits in between) would make, right from start to …….?. I enjoy your writing style, admire your skills and would love a visual book reference of all you have managed to achieve.One of the best practical and imaginative blogs I’ve found. Congrats on all you have accomplished – looking forward to the rest. Love the table! Just a thought, since you are unsure of the artwork for the hallway, why not photographs? They could be of family, pets, architecture,etc. in great frames that you have added your magic. Oh, I’m not unsure about what I want, but finding a way to get it (that I can afford) is the issue. 🙂 I have a photo from our wedding day of the adorable chapel where we got married, and Matt and I are standing in front. We’re tiny in the picture, and the chapel surrounding by trees and nature is the focus. I want that picture turned into a large watercolor painting. 🙂 I know there are apps that can be used for that, or my mom could use her Photoshop magic to do that, but finding just the right look that I want has been challenging. (I’m quite picky. 😀 ) Plus, my mom is having computer problems right now. The other option is that I could actually commission a custom piece from an actual watercolor artist, but the one I had in mind doesn’t have sizes above 8 x 10 listed on her custom orders page, and she’s completely booked for the rest of the year, and has a waiting list for next year already. So for now, I’m just waiting to see if my mom can get her computer situation resolved and work her magic on the picture. Love it. Another idea….bed posts. We needed a 30″ table in our kitchen and all the affordable ones were downright cheaply made. I told him I had an idea and brought out this bedpost a friend gave us. My hubby decided he wanted to build it. 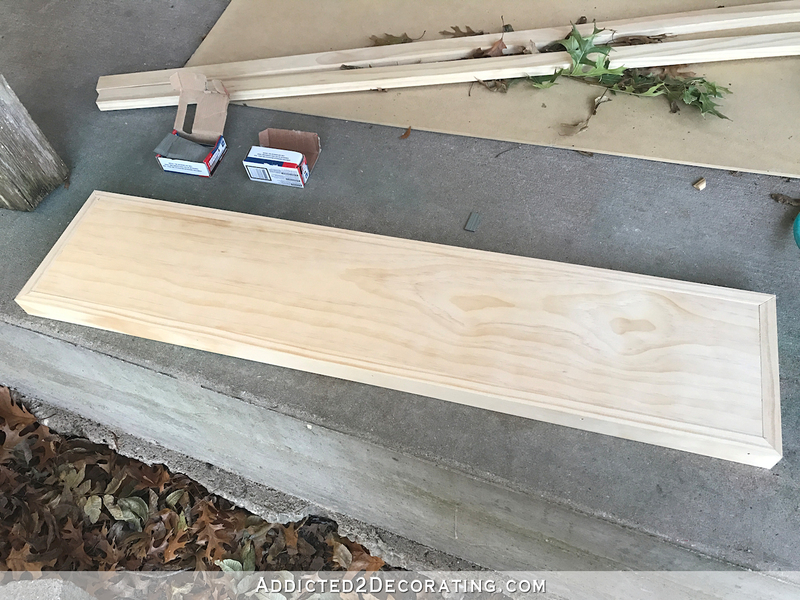 We cheated and bought the top from Lowes, used the bedpost as the base and he built just basic legs I found a pic of online. Then I finished it. Will send DM with pic since I can’t upload here. Great idea! Narrow tables are so hard to find!! I’m thinking though that it either needs to be more crisp or more rustic. Right now it feels like it’s somewhere in between and not quite rustic enough to be rustic and not quite finished enough to be classic. Know what I mean? I’m sure you’ll figure it out and make it amazing! “… I know you’re thinking, “Who the heck just happens to have two turned wood columns on hand in their stash of stuff?” …” *shyly raises hand* Uhm … er … well … *I do*! I actually have a pair of antique oak balusters that came out of an old house in Pennsylvania that another popular shelter blogger used as decor/accent pieces in her former home, and she graciously sold them both to me for a fraction of what they would’ve cost if I’d tried to buy them here in Los Angeles. They have a dark stain on them and are really quite heavy, and you can tell they are genuinely old architectural pieces. Just lovely! 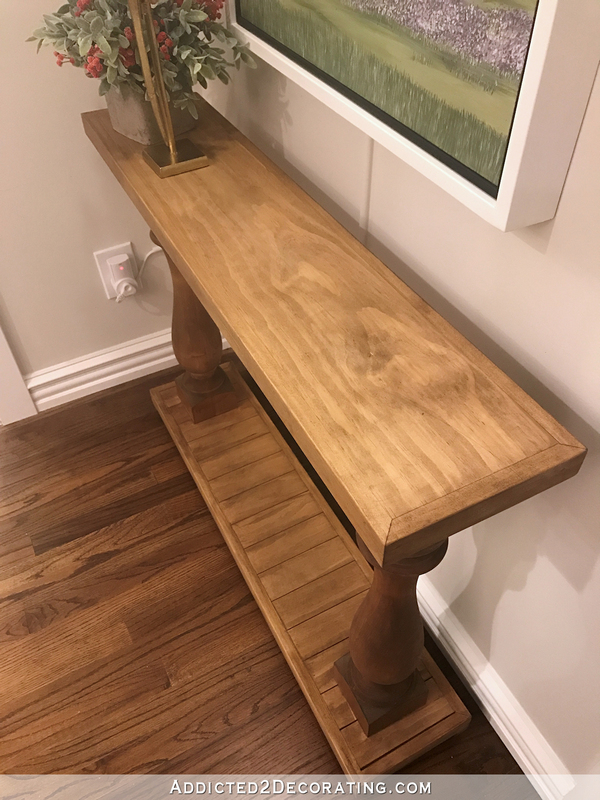 For me, it’s unusual to have something like that laying around my apartment, but Kristi, you are an artist and a designer who also happens to be an impressive home remodeler and wood worker, so it’s really not that far-fetched that you may have some wood columns in your stash! That table you built is gorgeous! You did a really amazing job duplicating the original, you should be so proud of yourself! It’s going to look lovely in your newly remodeled hallway. The table is beautiful and thank you for the tutorial, but I have a question about the other columns that you used in the kitchen. 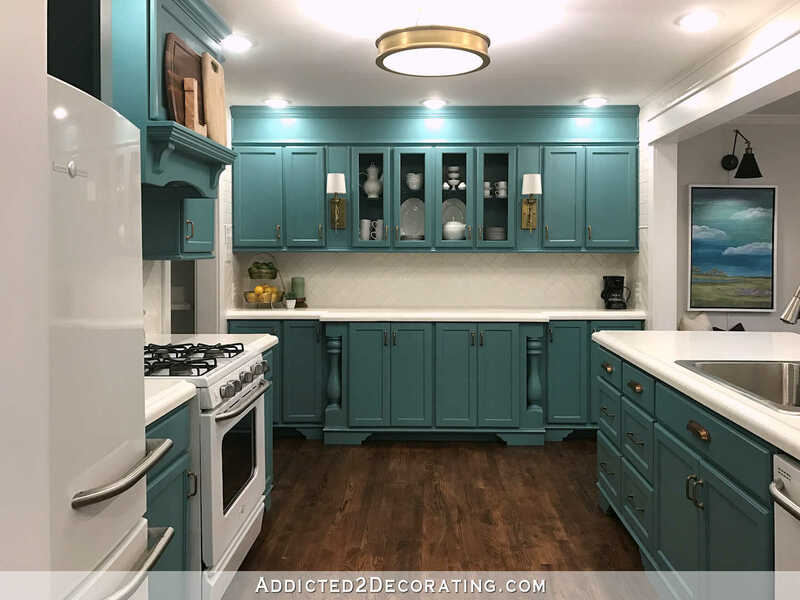 I admire the look and am considering something similar for when we do our kitchen. Not sure about the practical side though. How difficult is to keep them clean? I haven’t found them to be difficult at all. Just a vacuuming with an upholstery brush attachment every once in a while gets the job done. But mine are also off to the side and not around the sink or stove. I would imagine keeping them clean if they’re by a sink or stove (especially a stove) would be more difficult. I personally wouldn’t recommend that, unless you make sure to leave enough space to get your and behind them and all around them for easy cleaning. Nice. I’d paint it. What is that receptacle on the wall next to the table? It has a tiny light. It’s a wifi extender. Without it, our wifi signal doesn’t reach that end of the house very well. I’ll probably move it to a more obscure place now that that wall has something pretty on it. Thanks. I didn’t know there was such a thing. I really love this! Fantastic job. I really hope you are able to get the stain to your liking. 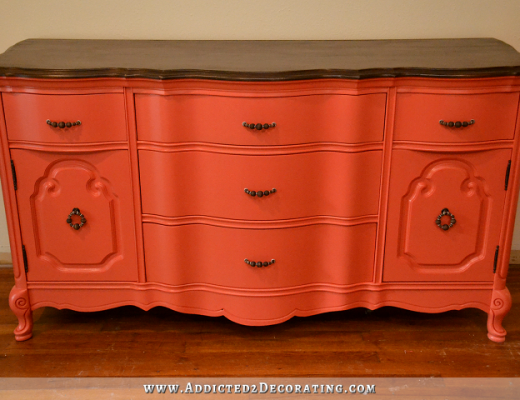 I think it would provide a lot of warmth against all of the painted surfaces in your hall. It’s such a pretty table! Love it! The console/hallway table is gorgeous Kristi, you’ve done yet another awesome job. Well done. I love this! Thank you so much for the information on how to build it. 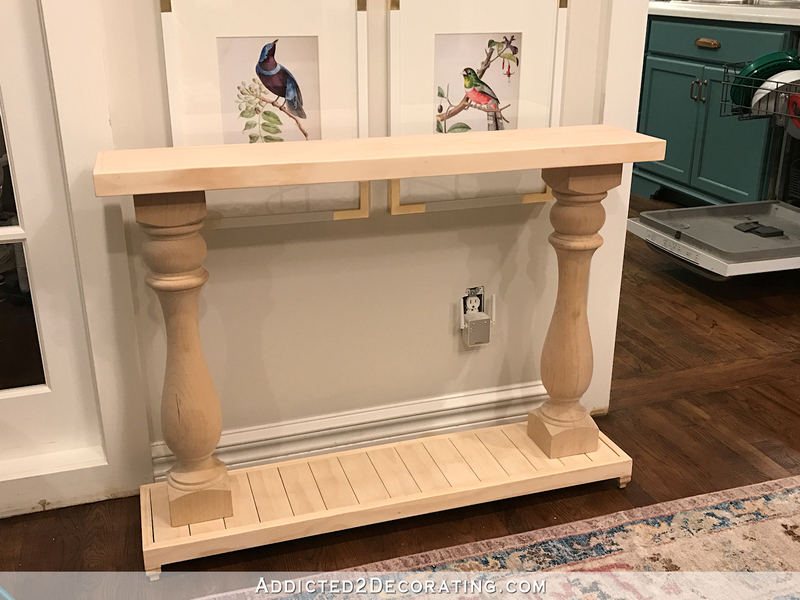 I’ve been looking for a long but narrow console table that would go opposite my china hutch in my formal dining room and this would be perfect!